AirServer is an application that allows for broadcasting an iOS device screen to the screen of a Mac computer, which is useful for presenting with an iPad. In addition, it’s great for help desk support, allowing for an iPad screen to be visible on a Mac desktop, which the help desk will be able to view remotely. • Open AirServer by using Spotlight (magnifying glass in the upper right corner of the screen) or by navigating to the Applications folder and opening it manually. • In the General preferences, set the computer name to your school, your name and room number. • In the General preferences, change the Password field to require some type of password. • In the Advanced preferences, make sure that Automatically Check for Updates is not selected. • Use AirPlay on an iOS device to share its screen with your Mac. The quickest way to start AirServer is to use Spotlight, the magnifying glass icon in the upper right corner of the screen. 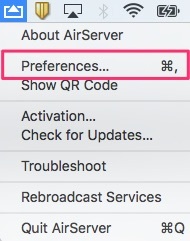 After clicking the magnifying glass, just start typing “AirServer,” then launch it by clicking on the option that looks like the one below or pressing return. Once AirServer is open, you’ll see a new icon in the menu bar at the top of the screen. The AirServer menu is represented by the icon circled below. Just click on it whenever the AirServer menu is mentioned in this document. You’ll notice that the AirServer menu icon (on the left) looks very similar to the Apple Displays menu icon (just to the right of the AirServer icon). The AirServer menu icon has the triangle at the top of the rectangle and will always be to the left of the Apple Displays menu icon, though they won’t necessarily be directly adjacent to one another. In the AirServer menu, first choose Preferences…, which will open a new window. On the first tab, General Preferences, the Computer Name and Password fields are significant. No password will be required to connect to AirServer. Manually type a password of your choice. Any iOS device wishing to connect to AirServer will be prompted for the password. Only those who have the correct password will be able to stream and mirror to AirServer. This will prompt you for permission when someone tries to connect to your computer. You can either accept or decline the incoming device. On the Advanced tab, Automatically Check for Updates should always be off. In order to make sure AirServer works reliably and to keep the list of AirPlay devices at a minimum, turn OFF Automatically Launch on Startup. AirServer should be quit when not in use. Click on the red dot in the upper part of the window. Restart your computer and now AirServer has been configured and is ready for use. How do I find what version of AirServer I have?